OK., some may not think a Football Stadium is exactly a tourist attraction in Kathmandu, but it's a major landmark and if you are a fan of football and sport in general, it's well worth a quick visit. It is named after the Nepalese Martyr Dashrath Chand, a Politician who did much for the Country by supporting the Nepal Praja Parishad Party, there aim being to free the people more from the ruling classes. He was eventually caught, tortured and shot in 1941 aged 22. 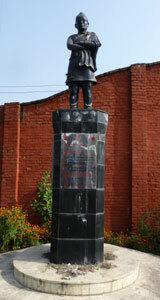 The Premier Football League in Nepal is known as 'The Martyrs League'. 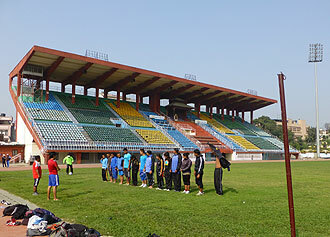 The Stadium was purpose built in 1956 and underwent much improvement when Nepal were selected to host the 1999 South Asian Games (Athletics). Since then it has also hosted the AFC Challenge Cup in 2012 and the 2013 South Asian Football Federation Championship. In 1988 93 people lost their lives in the Stadium whilst seeking shelter during a football match when a torrential hailstorm suddenly happened. It is said that whilst running to the main Stand for cover they were turned away causing them to rush for the exits which were locked. A sad day. It would appear the Stadium is always open to anyone who wishes to go in. Out of courtesy I asked a person who appeared official and he just just to more or less help myself and go where I wanted to. Who could resist running out the Players tunnel to a crowd of about three!! Whilst there it appeared there were two lots of training going on; one football and the other, something else, Athletics I think. Halfway up the main Stand is a VIP position with a throne. I can only imagine this was once for any attending member of the Royal Family and it's been left as is. Maybe on purpose, who knows. All in all it was a pleasant experience, an experience of going somewhere not so many tourists do, but it's Structure of importance to the Nepalese people and one I think, they can be proud of. Footnote; To walk round the Stadium only needs about half an hour, so if you are a Sports fan, do as I did and afterwards go to the Tribhuvan University International Cricket Ground which is only about a mile away. Luckily when I went a Super Sixes Competition was about to start so there was some activity.